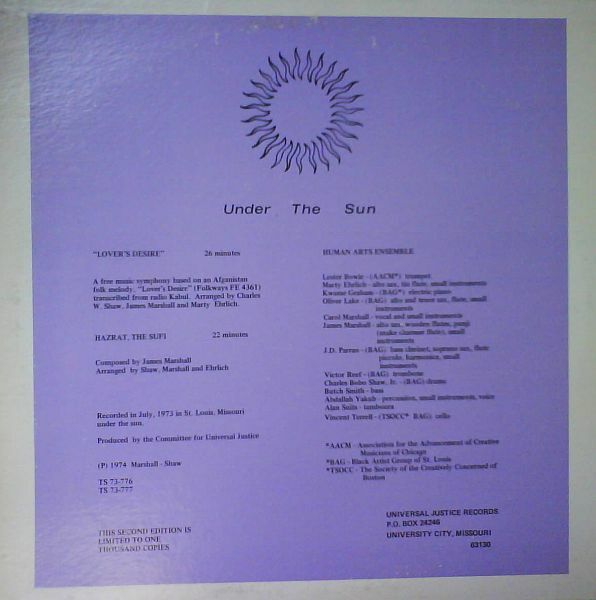 Under The Sun is recorded in July 1973 in St. Louis, Missouri under the sun. The album is produced by the Committee for Universal Justice and released in 1974 on Universial Justice Records. Side A. “Lover´s Desire” (26:00) is a free music symphony based on an Afganistan folk melody, ‘Lover’s Desire’ transcribed from radio Kabul. Arranged by Charles W. Shaw, James Marshall, Marty Ehrlich. Side B. “Hazrat, The Sufi” (22:00) is composed by James Marshall and arranged by Charles W. Shaw, James Marshall, Marty Ehrlich.